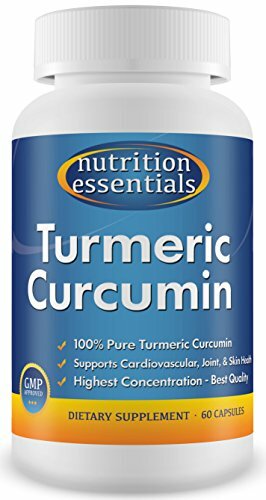 Home / Advanced Physician Formulas / Natural Brain Function Support Supplement – Unique Day & Night Advanced Nootropics Formula, Supporting Brain Health, Memory, Energy, Clarity, Focus & More. 120 Smart Pills. 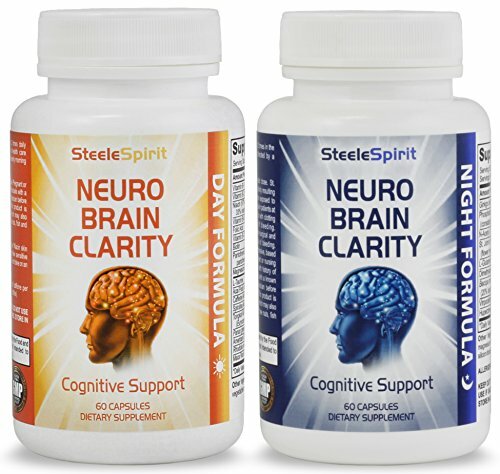 Natural Brain Function Support Supplement – Unique Day & Night Advanced Nootropics Formula, Supporting Brain Health, Memory, Energy, Clarity, Focus & More. 120 Smart Pills. 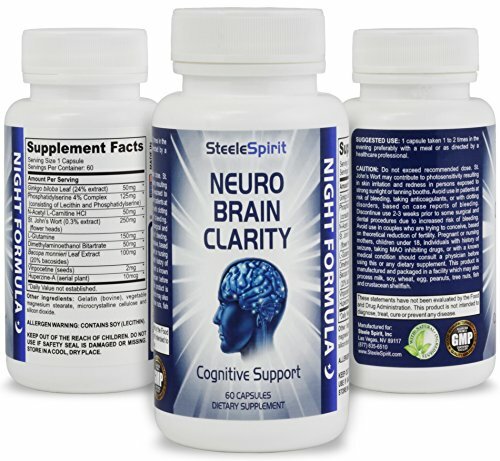 PHYSICIAN FORMULATED – Steele Spirit Neuro Brain Clarity, is a unique 24hr brain booster stack, formulated by an anti-ageing expert. 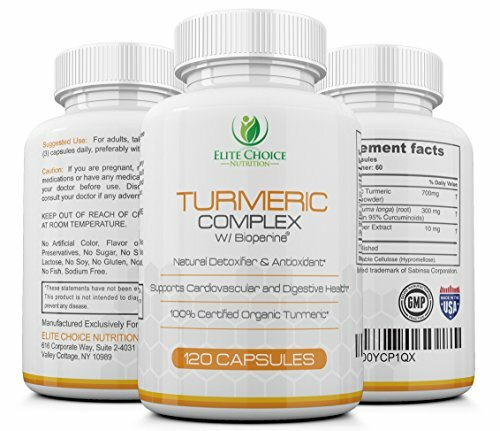 It provides your brain with the Day and Night support it requires to help you function better during the day and then supports learning, memory retention, repair and rejuvenation while you sleep. For a complete list and explanation of each ingredient, please read under the “Product Description” heading below. 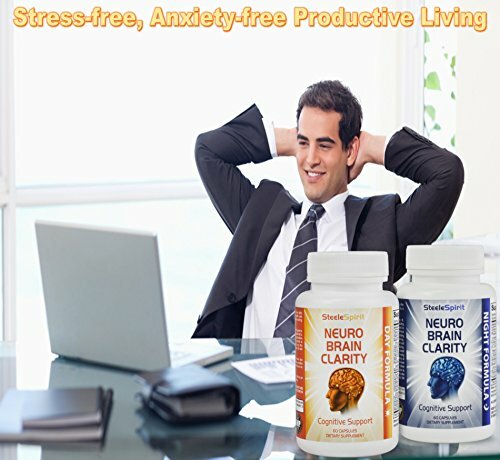 COMPLETE ALL-IN-ONE SOLUTION – rather than drink coffee and energy drinks to help you “stay productive” and “just get thru the day,” – AND instead of having to buy several different products to help with stress, memory, energy and Brain Support, our Unique Neuro Brain Clarity offers you the benefits of several different brain pills and supplements in one package, at a cheaper price than buying 2 or more products, which is more convenient for you and your pocket. 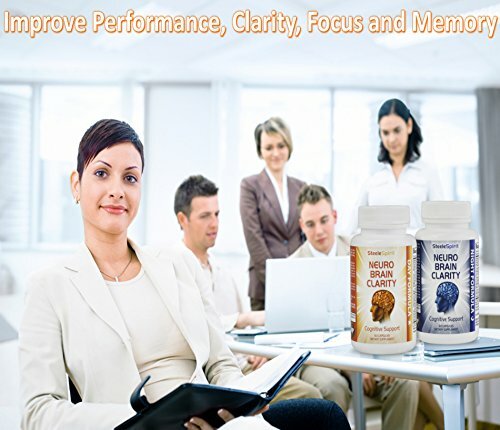 POWERFUL DAY FORMULA – gives you long lasting energy without the harsh side effects that many energy pills have – helps energize your brain to improve concentration, clarity and performance during demanding tasks and promotes both mental focus and a calm, smooth energy so you’ll love how at ease and on top of your game you’ll feel at work and at home. ST. JOHNS WORT – Mood-Supporting herb. DMAE – DMAE is thought to promote the production of the neurotransmitter, acetylcholine. BACOPA – Supports memory and helps replace worn-out neurons with new ones. PHOSPHATIDYLSERINE – Helps Make stronger memory, learning and nerve cell health in certain areas of the brain. ACETYL-L-CARNITINE (ALC) – Used in the transmission of messages in the brain. GINKGO BILOBA EXTRACT – Supports mental alertness, concentration, and circulation in the brain. L-GLUTAMINE – An amino acid to combat stress, elevate energy levels in the brain and increase mental alertness and concentration. HUPERZINE A – Supports nerve health, memory, learning, alertness, and energy. B VITAMIN COMPLEX – B-1, B-2, Niacin B3, B-6, Folic Acid, B-12, Biotin B7, Panothenic Acid B5, B vitamins have been called the “happy vitamins” or “anti-stress vitamins.” They are able to Strengthen energy levels, increase your tolerance to stress and can ward off brain aging. MAGNESIUM – Crucial for the bodies function. L-TAURINE – Helps your cardiovascular system. ACAI FRUIT – Can help with neurological diseases. CAFFEINE ANHYDROUS – Can stave off feelings of tiredness and lethargy and help with weight loss. SPIRULINA ALGAE POWDER – Can boost energy. TONGKAT ALI ROOT – Can help with stress and energy. PANANX GINSENG ROOT & AMERICAN GINSENG ROOT – Can help Strengthen energy, mental performance and well being. RHODIOLA ROSEA ROOT – Promotes memory, focus and relaxation. MACA ROOT POWDER – Can help imrove energy levels. 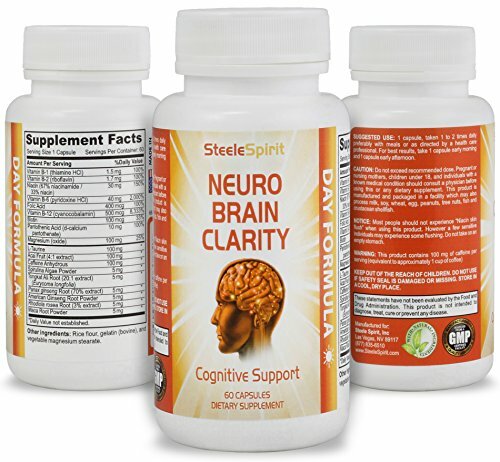 PHYSICIAN FORMULATED – Steele Spirit Neuro Brain Clarity, is a unique 24hr brain booster stack, formulated by an anti-ageing expert. 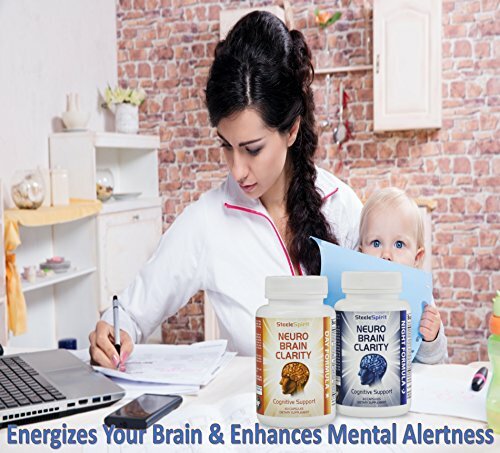 It provides your brain with the Day and Night Make stronger it requires to help you function better all over the day and then supports learning, memory retention, repair and rejuvenation even as you sleep. For a complete list and explanation of each ingredient, please read under the “Product Description” heading below. 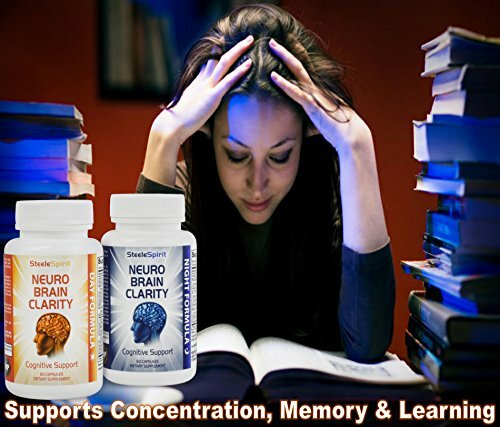 COMPLETE ALL-IN-ONE SOLUTION – quite than drink coffee and energy drinks to help you “stay productive” and “just get thru the day,” – AND instead of having to buy several different products to help with stress, memory, energy and Brain Make stronger, our Unique Neuro Brain Clarity offers you the benefits of several different brain pills and supplements in one package, at a cheaper price than buying 2 or more products, which is more convenient for you and your pocket. POWERFUL DAY FORMULA – gives you long lasting energy without the harsh side effects that many energy pills have – helps energize your brain to Strengthen concentration, clarity and performance all over demanding tasks and promotes both mental focus and a calm, smooth energy so you’ll be able to love how at ease and on top of your game you’ll be able to feel at work and at home. 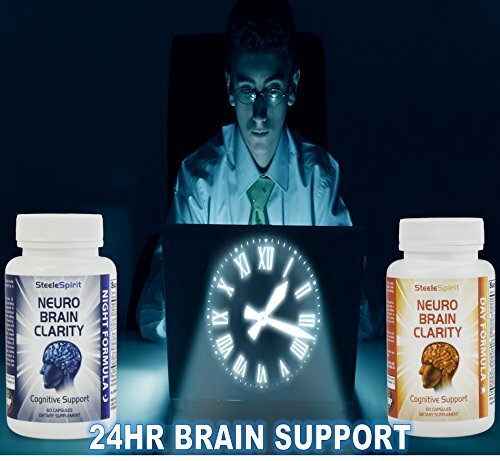 ADVANCED NIGHT FORMULA – helps increase oxygen and circulation in the brain to Make stronger brain health even as you sleep and helps Strengthen your learning capacity, memory and cognitive function – The combination of St. John’s Wort and L-Glutamine in this blend help to combat stress and Make stronger your overall mood all day long. 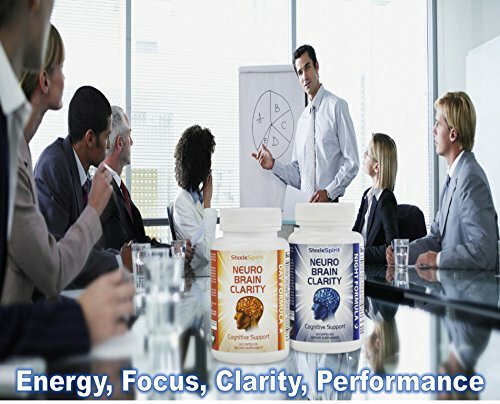 QUALITY YOU CAN TRUST – our potent brain enhancer, Neuro Brain Clarity, is made in the USA in an NSF Certified, GMP, FDA Registered facility. We are so confident that you are going to find it irresistible, that we’ll refund every penny if you don’t adore it. Simply contact Steele Spirit directly for a full refund. What do you have to lose?